Over recent years Chrysler has provided numerous models with, shall we say, different styling techniques which have drawn attention to the particular model. There was the Viper, Prowler and PT Cruiser which began the trend. Then there was the 300C. More recently it is the Dodge Nitro with its own unique appearance. This model features a 'tough' look, there is no doubt about that. It's the type of look that you either like or dislike, in so much as the Nitro's appearance excludes the traditional 'middle ground' of opinion. The perception of toughness comes about because of the small 'glasshouse', slab sides and exaggerated mudguard flares. The huge wheels (on the SXT) add to the perception. So, too, do the big door handles. But after a few days in the saddle (so to speak), just what view can be formed about this American designed and manufactured SUV? We drive it a short 166 kilometres around suburban Melbourne to gain an opinion. The road surface was 'tarmac' all the way, no unsealed roads or tracks on this occasion. The Dodge Nitro comes along in two trim levels. Both are available with a choice between a 3.7 litre V6 petrol or a 2.8 litre 4 cylinder diesel engine. The petrol engine models come with a 4 speed automatic transmission, whilst the diesel has a 5 speed automatic. Manual transmission is not available. 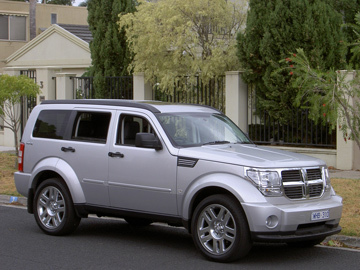 The test car, a Dodge Nitro SXT, was fitted with the 2.8 litre common rail diesel. Maximum power from this DOHC diesel engine is 130 kW at 3,800 rpm. Torque is a very worthy 460 Nm at just 2,000 rpm. A 5 speed auto gearbox is matched to the diesel. Only the 5th gear is overdrive. Twenty inch alloy wheels, which look good, are standard on the Nitro STX. The driving experience is pleasant enough. This is not a performance car, so the acceleration is somewhat sedate, but it is certainly adequate. The go pedal is also on the 'tough' side of the equation. That is, a little more pressure than usual is required to operate the accelerator. The gentle approach is a good one, but that doesn't seem to fit the Nitro's make-up. There is no footrest for the driver's left foot. And for good reason, the transmission hump is so big that there isn't sufficient room for a luxury such as a footrest. Having said that though, the Nitro is comfortable for the driver. At idle, the traditional diesel clatter is readily heard when a window is open. And when you enjoy a diesel, it is reassuring to hear this familiar noise. The benefit of diesel is quite apparent when you review the fuel consumption figures. On the often quoted combined cycle (EU standard in this case), the Nitro consumes 9.4 litres of diesel per 100 kilometres. This increases to 12.2 litres on the urban cycle. This compares favourably with the petrol version, which consumes 12.1 litres and 17.5 litres on the two aforementioned test cycles (per 100 km). Prices for the Nitro begin at $38,990 (RRP) for the SX (petrol engine). The top-of-the-line Nitro SXT diesel begins from $46,990 (RRP), without options. The test car was fitted with premium paint ($450), sunroof ($2,000) and navigation/sound group ($2,750). Therefore, the test car had a RRP of $52,190. Physically, the Dodge Nitro looks bigger than it is. The length is 4.584 metres (that makes it longer than a Toyota Corolla, but shorter than a Camry), whilst it is 1.856 metres wide (which is wider than a Holden Epica, but narrower than a Commodore). The height is 1.755 metres. The Nitro SXT (diesel) weighs in at 1.97 tonnes. Interior space is plentiful. So too is the luggage space. A handy cover is fitted in the cargo compartment. The Nitro SXT features Chrysler's unique "Load 'n Go" system. This is a pull-out tray, mounted to the boot floor (thus taking up space) which is meant to assist any loading processes. Perhaps it suits Americans, but I found it is just as easy to use the old fashioned way of loading. 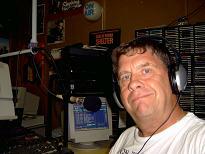 Yes, the old way still works for me! Generally speaking, American cars do not have the finesse of European cars. And that is true of the Dodge Nitro. But that is not meant in a derogatory sense, because sometimes European cars lack common sense with the operation of simple controls. 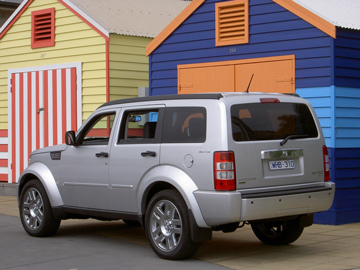 The Dodge Nitro, though, is amongst the better built American cars that have been released in Australia. The Dodge Nitro SXT is certainly a 'colourful' car. It's a model that stands out because of the 'tough' look. But it is a car with contradictions, although it is comfortable to live with (especially in the rear, where there is plenty of room). If first impressions are lasting impressions, then I suggest you go for two impressions. That's because the Dodge Nitro is the type of car that needs to 'grow' on you. On that basis, the Dodge Nitro will be a 'hit' for its looks, more so than its qualities as a means of transportation. Therefore, either the appearance of the Dodge Nitro will convince you to buy it, otherwise you will be looking elsewhere.